The Samsung Galaxy S is a fantastic device that has not long been out. We now are starting to hear rumours of a new next-gen version of the smartphone that will be called the Samsung Galaxy S2. The Galaxy S2 is said to have a 2GHz processor. We hear the S2 will also have a 720p HD display that can display an impressive 1280 x 720 pixels. The screen will measure 4.3 inches. We also hear that the Galaxy S2 will have 1GB of RAM and 4GB of ROM along with 32GB of storage space built in. More can be added by using a microSD if needed. On the back is rumoured to be an 8 megapixel camera. Back on to the 2GHz processor. It is unclear at the moment if it will be two 1GHz chips or a single 2GHz processor. Either way, it sounds powerful and should add more kick to the already fast Galaxy S.
For connectivity the rumoured smartphone is said to have Bluetooth 3.0 and Wifi b/g/n. Sensors include a GPS, accelerometer and a gyroscope. When launched it is said to run the next version of Android believed to be 3.0 and codenamed Gingerbread. I'm not fully convinced the rumours are true at the moment as the retina display style PPI seems to be just an estimate based on the phone rendering above. Also the 2GHz CPU seems like a bit of a step up from the 1GHz devices we are seeing at the moment. Perhaps a 1.2GHz or 1.5GHz early next year, but 2GHz seems to be pushing it at the moment. What are your thoughts? Will Samsung launch the Galaxy S2 with the above specs? The computer mouse has advanced over the years by trimming down a little, becoming optical, becoming more responsive and becoming wireless to name a few advances. The next step is to get rid of the mouse altogether and have an invisible mouse, also known as Mouseless. The concept was created by Pranav Mistry along with Patti Maes and Liyan Chang and basically gets rid of the mouse completely. By using an IR sensor with some custom software, the movements of a hand on a desk can be interpreted in to mouse and finger movement allowing users to simple glide their hand on a desk and tap the desk with their finger. The IR sensor sits on the back of a laptop and detects movement to the side of the laptop. By skimming the IR beam across the desk the software can pick up where the signal is cut off and calculate where your hand is and move the mouse pointer appropriately. The system costs just $20 to build which is interesting and would allow laptop users to more comfortably work as well as carry less around when out and about. The video below shows a demonstration of how the software works and how accurate it is. It's fairly impressive stuff and would be good for companies to adopt in the future. Sony has released a firmware update for both the Sony NEX-3 and the Sony NEX-5 digital camera. The firmware brings a new 3D sweep panorama mode to the cameras allowing several pictures to be taken and then stitched together ready for a 3DTV to display the shots. Full details haven't been provided just yet on how exactly it will work, but from what we hear the camera, when put in 3D panorama mode, can be used to sweep around a scene with Sony's firmware converting those captured images to 3D. The cameras themselves were only just recently launched and are about the size of a Cybershot point and shoot camera with a large DSLR lens attached on the front. Inside a 14.2 megapixel sensor can be found and each camera uses the Sony E-Mount lens system. To use other Alpha lenses you can buy an adapter to convert them over. When we get some samples or details of exactly how 3D panoramas will work on the Sony NEX-X cameras, we'll provide an update. The iPhone 4 bumper case is simply a bit or plastic or rubber that stretches around the outer edges of the phone and protects the glass from touching surfaces as well as protecting the edges of the phone. The Vapor4 is exactly the same in that it covers the edges of the iPhone 4 and protects it... but the difference here is that the Vapor4 actually looks amazingly nice. As well as looking good, it will also fix the antenna issues with the iPhone 4 when in bad signal areas. It achieves this by lining the insides of the aluminium casing with a material that prevents the antenna from touching the casing, thus your hand cant break the signal. In tests the company found no interference. The case has all the right sections cut out allowing you to attach the dock connector, power it on and off and access volume etc... Overall it's very impressive. The downside is that the Vapor4 isn't the cheapest case around. It actually makes the expensive iPhone 4 bumper from Apple [AAPL] look cheap in that this model costs $80 for the enclosure and for an extra $20 you get the V4Carbon back to insert on the back of your iPhone 4 to give it a different look and protect the back glass. 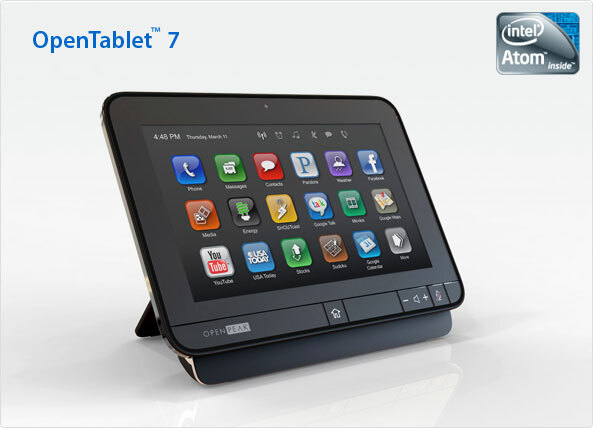 HP has launched the TouchSmart 600 multi-touch tablet PC. The HP TouchSmart 600 runs Windows 7 Home Premium, has a 23 inch 1080p Full HD display and runs Intel Core 2 Duo Processors (or Core i3 and i5). For connectivity it has WiFi built in as well as a BlueTooth connection. To make use of the large screen as a TV, an optional TV card can be purchased with the TouchSmart 600 allowing you to tune in to TV channels as well as record them if needed. Overall it appears to be quite an impressive package. With the added touchscreen it allows (in some cases) easier navigation around the PC and adds an extra layer of control. Prices for the HP TouchSmart 600 start at £1000 for the basic model with the lowest RAM and processor and go up higher when you add the optional extras on. Full details can be found on the HP site. The Horizon MiniPak is a portable fuel-cell charger that can be used to power mobile phones and other similar devices while on the move. The device costs $100 and provides enough power to keep devices charged. The unit accepts fuel cells and once inserted in to the charging unit, power is instant. The power generated it output through a standard USB port built in to the device and this USB port is used to connect devices such as an iPhone, BlackBerry and other devices including tablet. With the device using fuel-cell technology the device can generate power as soon as the fuel cartridge is topped up or replaced. There is no need to wait around to use the charger as power is instant the moment fuel is inserted in the cartridge. The MiniPak is capable of providing 1.5 to 2W of continuous power and the fuel cell's used can produce 12Wh of energy. The MiniPak uses a combination of Horizon’s mass-produced PEM fuel cells and a new low-cost metal hydride storage solution, which is able to store hydrogen safely as a dry, non-toxic and non-pressurized material. The fuel cartridge contains a metallic sponge that is able to absorb hydrogen and turn it into a solid hydride. It is then able to release it back to the fuel cell when needed. The PEM fuel cell combines oxygen from the air with the stored hydrogen - electricity via its USB port and trace amounts of water vapor. The Horizon MiniPak is available now with full details available over here on the official site. Check out the PR2 robot that has been hacked to play pool. The "Poolshark" team who are working on the project have been busy for a week and have now managed to get the PR2 to pocket shots on the table. This includes long shots and awkward angle shots too. Nokia [NOK] will be launching the Nokia N8 in August. The Nokia Conversations YouTube channel has a few videos uploaded with one of them detailing the Nokia N8 photo editing along with the video editing functions of the device. The video shows a few examples of how to browse through photos and although not the most exciting of things to watch, it does move on to the video editing functions of the phone where transitions can be made between clips that have been combined together. The application actually looks very good and seems that with the mix of a high resolution camera and some nice transition features it could be a good selling point for the Nokia N8. We've seen a number of tablets get announced and often delayed. Most of them don't look that good, but one that falls in to this "delayed" category is the Notion Ink Adam. The difference with the Adam is that it looks fantastic and is one we are waiting for. However, recent rumours indicated that we might not actually see the Notion Ink Adam till almost the end of this year in November. Reasons cited for the delays this time around revolve around the investors who want the Notion Ink Adam to hit the market near Thanksgiving rather than earlier. The quote spotted on a few websites was actually quoted with a bit missing. SlashGear managed to get some details from the guys at Notion Ink to see what they had to say about it. The November launch date is for a few countries rather than all countries although Notion Ink didn't indicate what regions would launch in November and which ones wouldn't. However, they did indicate that an update about a launch was coming soon. It does seem that a Q3 launch is still likely which SlashGear point out, gives Apple [AAPL] another quarter to get even further ahead in the game. Hopefully we get information soon about the Notion Ink Adam as when things drag on so long, it's easy to move on and find something else newer. The Apple iPad UK launch happened a few days ago and from what we hear, the iPad 3G models were the more popular of the two in terms of queue sizes in the London Apple store on Regent Street. 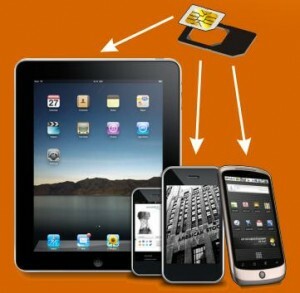 For those who want an iPad 3G in the UK but don't want to start up another subscription to the four big microSIM providers, those being Three, Orange, O2 and Vodafone, a handy microSIM adapter has been created that allows you to convert your microSIM back in to a regular SIM for use in a mobile phone. The adapter is relatively cheap at €4.50 and has a regular size SIM card with a hole cut out for a microSIM to sit in. Of course when you get a microSIM in the UK you do get the full housing that can be used in a mobile phone although the microSIM punches out of the larger SIM making the larger part possibly unusable although if carefully held you might get the two back together and in to an iPhone. From what we see on the adapter, it has sections in each corner of the cutout that prevent the microSIM from being pushed all the way through the adapter making it easier to use. It's one option that does cost to buy, but can save you a month to month subscription cost if you only need 3G from time to time. As well as the Favourite line of games another range has been created called the "Greatest Hits" collection. Games in this section include the following which are priced at $19.99. 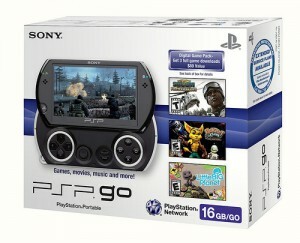 Also a deal on the PSPgo is being made that will go on till next March 31 2011. When purchasing the PSPgo you'll get an email where you can use a voucher to get three games for free. The full details of all the offers as well as a few other games coming soon to each new category can be found over at the PlayStation Blog. Flash drives often come in a number of shapes and sizes. We have seen burger flash drives in the past along with other various items being used. The latest I came across today are USB Flash Drive Cufflinks that allow you to hold a shirt cuff together as well as easily carry your data around with you. Now introducing the perfect pair of cufflinks for work. 2GB USB Flash Drive Cufflinks (2 GB each, total 4 GB) are not only engravable, but feature functional USB drives making it possible for you to keep all of your must-have presentations and important documents with you wherever you go. Never be without functional fashion again. 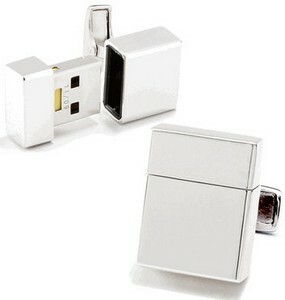 The cufflink flash drives cost $195 for the pair and each cuff link in the set has 2GB allowing for 4GB of storage to be carried around with you. 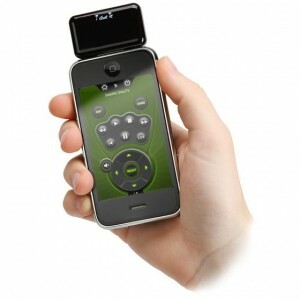 i-Got-Control is a universal remote control designed for the Apple iPhone. Apple [AAPL] recently allowed the dock connector to be used by 3rd party applications and in doing this, it allowed the iPhone remote control to be built. The i-Got-Control is a device that plugs in to the dock connector on the iPhone and allows users to control their TV, DVD, BluRay player and many other gadgets from the screen of their iPhone. The application that is used with the dock connector comes with many devices programmed in. If yours isn't one of them then a few simple taps on the screen and button pushes on the other remote control allows the software to quickly learn how to communicate with your HDTV for example. Silicon Valley startup Anybots sees robots in the future of your workplace. It’s debuting a two-wheeled mobile robot named “QB” that is equipped with a camera and interactive touch display in an effort to one-up the concept of static teleconferencing. The website promises “one-click commuting” thanks to a web browser interface that allows a remote user to control QB’s movements. The premise is to get much closer to “real” virtual telepresence by allowing the user to roam around and initiate spontaneous conversations as if actually there in the flesh. The QB bot also features a speaker, laser pointer and a telescoping neck that lends it an appearance not unlike your friendly living room halogen floor lamp. Slated to be released this fall for a $15,000 sticker price, the bot actually compares favorably to the cost of high-end teleconferencing systems from HP, Cisco and other manufacturers. With the still-lagging economy finding businesses wanting to cut down on travel costs, telepresence could be an attractive “next best thing” type of option. Yet it remains to be seen if the marketplace will value the mobility afforded by something like a QB bot over a more traditional conference room setup — so it may be too early to proclaim an imminent takeover from our robotic overlords just yet. Check out a demo video of the QB bot below as well as an interview with Anybots COO Bob Christopher, featuring more video of QB tooling around. Let us know what you think of robotic telepresence: Could it be the next big thing for distributed workforces or perhaps a novel trend in office entertainment? Dell has launched a new thin and light laptop in the Inspiron range called the Dell Inspiron M301z. The new laptop features an AMD low-voltage processor. It measures less than an inch thick and weighs less than 1KG. The graphics chipset is the ATI Mobility Radeon. When purchasing the Inspiron M301z there are two options available for the processor which include an AMD Nile Dual Core Athlon II Neo K325 running at 1.3GHz and the Neo K625 running slightly faster at 1.5GHz. Memory wise the laptop can hold up to 4GB of DDR3 running at 1333Mhz. For storage the M301z comes standard with a 320GB hard drive spinning at 7200RPM. The screen on the M301z measures 13.3 inches and is in a widescreen aspect ratio capable of HD. There are two choices for the operating system which are both Windows 7 with a choice between the 64-bit Home Premium or the 64-bit Home Basic. Other features include an integrated 1.3 megapixel webcam, wireless connectivity for 802.11b/g networks and Bluetooth 2.1. Connectivity for physical ports includes two USB 2.0, 1 X E-SATA/USB 2.0, HDMI and an integrated 10/100 LAN. Also a mic in / line out and a 7 in 1 card reader is also included. 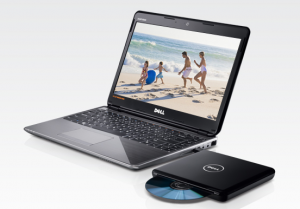 Various models are available now from Dell with the cheapest model starting at $999. Full details can be found over at Dell. HTC has announced the launch of a new Android based phone called the HTC Wildfire. The first and last time we heard of the Wildfire was when HTC ran a poll on a Facebook page to let users choose the name of the device. The HTC Wildfire has a 3.2 inch QVGA screen. The screen is capacitive touch as we normally expect on this class of smartphone. A 5 megapixel camera is found on the back and all the usual connectivity is thrown in there such as WiFi, Bluetooth as well as GPS for tracking your current location. The OS running on the HTC Wildfire is Android 2.1 from Google [GOOG] and HTC has installed Sense UI on this device. The processor running on the smartphone is the Qualcomm MSM7225 running at 525MHz. 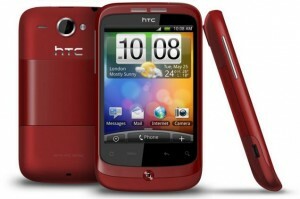 It is expected that the HTC Wildfire will launch in Q3 2010 across European and Asian markets. We received a Fit-U Wireless Mouse for review a few weeks back and have had the chance to test to see what it is, how it works and if it’s any good. The mouse it’s self is wireless and comes with a tiny USB adapter that you plug in to your computer. When inserted the adapter only sticks out a few mm making it small and out of the way. The mouse is powered by two supplied AAA batteries which are easily inserted by sliding the bottom of the mouse out and lifting it up. Once inserted the power switch found underneath can be flicked on ready for use. I tested the Fit-U mouse on a Windows 7 laptop and after inserting the USB adapter the mouse started to function within seconds with no software installation. This made set up very quick and simple. With the USB adapter being so small it is also safe to leave it in your laptop when your laptop is stored in a case as it is small enough to not get in the way. The mouse I found was comfortable to use both in medium and large modes although the larger version was a little more comfortable due to it being slightly larger under the palm providing support to the hand and wrist. Reasons other than comfort also include the ability to pack the smaller cover away should you be travelling with the mouse and using the larger cover at home on the desktop computer. Accuracy of the mouse was also good and although I didn’t particularly do any scientific tests, it worked just as I needed allowing me to navigate around Windows and various software without any problems. I have however read some reports of people having issues with their mouse with stutter from the mouse pointer and clicks. I didn’t experience any of that my self on the wireless laser version that I used though. The mouse comes with 6 programmable buttons allowing you to control various aspects of the operating system. With them being programmable you can set it to fit the functions you use most such as double clicks, change tabs and other various options. The laser accuracy can also be modified from 800dpi to 1600dpi with the push of a button making it also another handy feature. 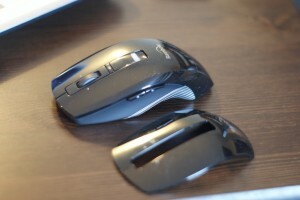 The mouse we reviewed was the wireless laser version. Other versions of the Fit-U include a laser wired, optical wirless and a laser bluetooth version. Although it’s just another mouse, it does work very well, is comfortable to hold, seems accurate for daily usage and is customisable. When taking the Evolution Pro out of the box for review the first thing noticeable is that it’s larger than a lot of other laser pens. It also is built to be more rugged. The laser pen it’s self is wider than previous laser pens we have reviewed. Part of the reason for that (if not all of the reason) is that this green laser pen uses AA batteries unlike the other review units we have looked at that use AAA batteries. The barrel of the laser pen is also textured allowing you to get a firm grip whilst using it. The technical specs show the Evolution Pro to measure 20.2×182mm. It weighs 82g and is made of aircraft grade aluminium. Output power on this laser pen is rated at 130mW although several variants of this laser pen range from 20mW up to 130mW each stepping up in price (prices can be found on the Wicked Lasers site). 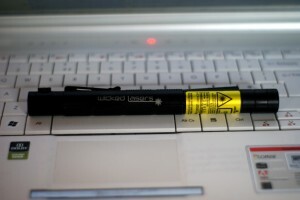 The laser pen as mentioned above uses AA batteries of which the laser pen will get power for about 30 minutes of usage. One thing to note with this particular laser pen is that it can be used continually for that 30 minute duration. This is a change from other laser pens we have reviewed that can be used for about 1 minute at a time before having to switch it off for a set amount of time to avoid problems. As can be expected with any laser pen in the 130mW range of power, a very intense green beam of light can be seen… even in daylight (although very feint). At night the beam is VERY clear to see and cuts right through the air in front of you shining a very bright dot on anything it is pointed at. Range isn’t mentioned in the technical specs of this laser, but previous lasers we have tested have been rated at being in to the miles (somewhere around the 25 mile mark). I have yet to test this, or find a suitable safe location to measure this, but from looking at the beam intensity and the divergence rating it certainly wouldn’t surprise me. So, what are they for? I really haven’t grasped the full benefit of having a laser pen this powerful (far too bright for a Power Point presentation), but what it is good at is pointing out stars, objects in the distance in daylight… perhaps on a building site where you need to point out something from a distance to someone… it would be certainly be bright enough for you to do that. It was back in February 2008 that the XPERIA lineup was born and it took Sony Ericsson almost two years to bring about the XPERIA X1 successor. The long waiting is over now and the XPERIA X2 is keen to prove to us all it was worth it. Both devices obviously have lots of features in common (it's the same amount of memory - both RAM and ROM, and the same CPU) but there are - possibly - enough improvements to make the XPERIA X2 a strong successor and a valuable upgrade. And by telling you that, we don't only mean the more recent version of WinMo. 6.5 was never officially compatible with the original. Anyway, the upgraded imaging is the greatest asset of the XPERIA X2 hardware and we're about to see how much it works in its favor. Before we kick off though, a bit of family tree stuff. The XPERIA X2 is only the second PocketPC in the series after the X1. The X10 runs Android and so does the rumored Robyn, while the Pureness isn't even a smartphone. The XPERIA lineup comes in different shapes and sizes but it all started with Windows Mobile. The X2 is perfectly aware of that and comes to offer some all-round PocketPC skills and the aggressive styling of its forerunner. As we said in the preview a few months back, there aren't many groundbreaking features to see, but the XPERIA X2 is definitely worth a look to check what it can actually do. Well, if you're looking for Snapdragon speed, you won't find it here. There's no capacitive touchscreen either. And the X2 also skips an FM radio and its camera has no Xenon flash. But you get all the business benefits you would expect in a phone in this class, with some nice media too. The Sony Ericsson XPERIA X2 packs the full range of connectivity options, hopefully a capable enough CPU, a comfy slide-and-tilt QWERTY keyboard, promising autofocus camera and, like its predecessor, it has a 3.5mm audio jack on board. The trackpad is also there (even if it's been redesigned). While the XPERIA X1 came with a 3" display, the X2's screen measures 3.2 inches, but keeps the same 800 x 480 resolution. Among the most important novelties brought by the X2 is the latest firmware version: Windows Mobile 6.5 Professional. The revamped touch-optimized X-panels interface has been promoted to a full featured system for handling various animated and interactive homescreens. Unlike the early version of the X2 which we had for a spin and a short preview, this one comes off the shelves so no excuses this time! After the jump a 360 degree spin awaits, along with our say on design and construction. But first things first - next up: unboxing. Nokia N900 is the final product which opens up a new path for the Finnish smartphone producer. After Google, which launched its new open source operating system for mobile phones, Nokia raised the stakes a few months later with its own vision, which is called Maemo. Android OS, as well as Maemo are both based on the well-known Linux platform, but they are pretty much different because they are the results of two different working teams. Before getting into more in-depth information, do not overlook the fact that we will be reviewing an Internet tablet, with some limited phone capabilities. So, be aware that some of the features that you'll probably be expecting from such a device might be missing. Also, bear in mind that Nokia might, or might not, add some new basic features or new complex ones in the future firmware updates, but do not rely on that. In the end, to quote one of the Nokia's officials: "N900 has become the high-end line-up of smartphones for Nokia and all other Maemo devices that will be launched will have specific high-end features". So, expect high prices for the next Maemo devices, but on the other hand, the Nseries prices might drop. Nokia N900 has been announced in August 2009 and made available on the market in November same year. The device is only available in Black and can be acquired for about $700 USD. The first time I saw Nokia N900, I was afraid its too bulky and ugly for my tastes. Automatically, I have compared it in my mind with the new Android smartphones and saw the N900 losing on all aspects. Fortunately, things are not as it seems at first glance, and Nokia N900 is really a very nice and stylish device. Yes, the device is pocketsizable and yes, it's big and heavy (110.9x59.8x18mm and 181g including battery), but it looks much better than HTC Touch Pro or any other bulky Pocket PC. It feels nice to the touch thanks to the matte plastic on the back, which also helps users have a good grip over the device. The only drawback that I found is the shiny material that covers the front part of the device, which is a fingerprint magnet. Still, the rest of the device is looking very good and, for me at least, it seemed ergonomic enough to be able to handle it with ease. Once you get used to its look and to its buttons layout, everything should work smoothly. In fact, besides the QWERTY keyboard the device doesn't really have too many external buttons. If you keep the N900 in portrait mode, you'll be able to notice on the right side a volume key near the top, a small power on/off button at the middle and a dedicated camera key near the bottom. On top of the smartphone, there's a microUSB port, as well as one of the two stereo speakers. The other stereo speaker can be found on the bottom of the phone, together with a 3.5mm port jack and a small sliding key which locks/unlocks the touchscreen. There's also a plastic stylus placed on the bottom left corner of the device, but I haven't used it too much. Above the generous touchscreen, there's a secondary videocall camera, as well as a small ambient light sensor and the in-call speaker. The backside of the smartphone features a nice 5 megapixels camera, which is protected by a sliding cover. When opened, it will also reveal a dual LED flash and Carl Zeiss optics. The camera is surrounded by a thin plastic strip, which can help users watch movies in a more relaxed position without the need of keeping the phone in hand. When the device is slided, it will reveal a full QWERTY keyboard that features 38 small keys. While the layout is good, I still had the feeling that the buttons are too small and a little bit too crowded. Still, that doesn't makes a bad impression and texters will be happy to find that the keyboard is actually very nice to the touch and responsive enough to be able to text without mistakes. The backlighting of the keyboard is good and very nice, with a bluish light that shows all the keys. Overall, Nokia N900's finishes are exquisite and puts it in front of many other (ex)high-end Nokia devices, in terms of design and ergonomics. The rounded shapes of the device also recommend it as an easy-to-carry smartphone and really good-looking business tool. Nokia N900 features a large 3.5-inch TFT resistive touchscreen, which supports 16 million colors and 800x480 pixels resolution. It also includes features like proximity sensor for auto turn-off and accelerometer sensor for auto-rotate. Perfectly visible in the sunlight, the display is also surprisingly responsive for a resistive touchscreen. In fact, first time I used the device, I tought that Nokia finally made its first capacitive touchscreen, but is seems that I was mistaken. The display is still resistive, but very well crafted, so you will barely feel the difference when it comes to responsiveness. Of course, you won't be able to take advantage of features like multi-touch, but I'd say this is a pretty good display. It is also well-protected against scratches, which is a big advantage as the device doesn't feature a leather case or something close to that. Of course, you could buy one, but the fact remains that you won't have any troubles with scratches unless you are fool enough to keep it in the same pocket with your keys, which I doubt it, as the device is pretty big to not fit in the pocket with anything else. Moreover, Nokia N900 includes a dedicated PowerVR SGX graphics CPU with OpenGL ES 2.0 support that enhances multimedia experience, which implies running games or movies on the screen. I only noticed a small drawback and that is the fact that you won't be able to use the phone in portrait mode unless you set the device to turn to dial mode as soon as you unlock the screen. Otherwise, you will be stuck to the landscape view. Further, the transgression to portrait mode doesn't function well enough, and you might end up clicking on the Phone icon on one of the additional homescreens. N900 also includes a 5-megapixels camera, but this is not just a usual camera. Nokia has put in some effort into this and managed to embed a nice camera with autofocus, dual LED flash and Carl Zeiss optics. You can take snapshots either in 5-megapixel high resolution or use the more unsual, but very cool 3.5-megapixel wide resolution. I had some doubts before actually using the camera to take pictures, knowing the level of technology that Nokia usually puts into its smartphones. Enough said, these doubts fade away once I started to take some snapshots. 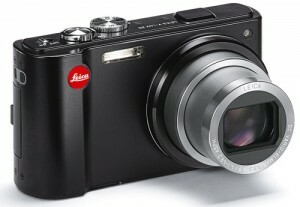 I was amazed by the accuracy of the camera, especially when using the 3.5-megapixel wide resolution. The pictures are simply excellent, even when you don't benefit from the best light. The night pictures are also pretty decent, but you will need to be somewhat close to the subject that you intend to capture as the dual LED flash has its limit. The interface of the camera is pretty standard for such a camera and easy to use. Users will be able to change resolution, White balance, ISO sensitivity and Exposure. Camera mode can be set on Automatic (default) or you can choose one of these options: Macro, Landscape, Portrait, Action. Camera also includes the geo-tagging feature video light. For those of you that are interested in video capturing, I'll have to say that Nokia N900 excels to that too. It can record clips in WVGA(848 x 480)@25fps, which is pretty nice. Check out the samples below to get an idea of what this high-end device can do with its camera. Maemo 5 is the first open source operating system coming from Nokia, and a new one coming from the Finnish giant for a long time. As its base stays in the Linux OS, you will probably notice lots of similitudes with Google's Android, which has about the same roots. First of all, Nokia N900 runs Maemo 5, version 1.2009.42-11, which will probably receive upgrades in the future. Anyway, the main thing that I noticed is the "lack" of freezes or errors. I haven't gotten any of the usual lock-ups that Symbian smartphones have from time to time and that made me really happy. Secondly, I noticed that the device runs pretty smooth without slacking at all, even when more applications are running in the background. Yes, you can run multiple apps and can go back to whichever app you were running previously, as long as it has been alt-tabbed in the background. The operating system keeps them resident in memory and you can go back to it from the homescreen. Basically, it works like a task manager with all the minimized apps showing on the homescreen like small windows, which can be easily clicked. Just like the first Android version, Maemo 5 features 4 different homescreens, which can be browsed by swiping your finger to the left or to the right of the screen. These can be customized with new shortcuts, widgets, bookmarks and many more. By default the homescreens contain: Calendar, contacts, phone, email; Ovi Store and Maemo store; Weather widget; Twitter, Facebook and Google widgets, as well as shortcuts to Ovi account, Ovi maps, Gallery, Ovi gallery and Email. To each and everyone of these homescreens can be added more shortcuts, contacts, widgets or they can be emptied. Clicking the latter will open up the second window of the main menu, which contains even more functions and apps: Notes, PDF Reader, File manager, RSS, Sketch, App manager, Backup, Get started (demo movie), X Terminal, Amazon, AP News, Facebook, ForecaWeather, Documents To Go, and some games (Blocks, Chess, Mahjong and Marbles). As the device doesn't really feature a Back key, you can click either on top or at the bottom of every menu to go back one step (click on empty space and not on any of the icons). Another interesting feature that I found is the fact that you can quickly access Profiles, Clock & Alarms, Bluetooth and Internet connection by clicking clock or the battery icon that appears on top left of any of the homescreens. Nokia N900 is not a phone, but an Internet tablet and that really shows when it comes to phone features. It's even funny as you won't have access to a dialer pad unless you make a shortcut on one of the homescreens that will get you into the phone functions of the device. There's also another option that enables users to get right into dialer pad or call history, as soon as they unlock the touchscreen and keep the device in portrait mode, but that doesn't always responds, so you will need to click on the shortcut from time to time. Anyway, the place where Nokia N900 really excels is the web browsing experience. There is simply no other device that can reach to this level of accuracy in redering web pages, as well as speed of loading. Moreover, the Mozilla-based browser features Adobe Flash 9.4 and not the "weakly" Flash Lite, which is common to most high-end devices as of lately. If you usually visit webpages rich in Flash content, this is the right device for you. Zooming in and out can be easily done by double tapping on the spot you want to zoom or by simply making a spiral gesture on the screen. I personally recommend the first option as it works flawless and is very fast. The panning and adjustings of the pages are excellent, which makes N900 the best Internet tablet there is on the market at the moment. Unfortunately, Nokia N900 is not compatible with any Symbian or Java applications, but I think the Maemo store has some good third-party apps if you want more customization for your device. Nokia N900 features all the possible connectivity techs that are available: HSDPA (10 Mbps) and HSUPA (2 Mbps), GPRS and EDGE class 32 High-Speed Circuit-Switched Data (57.6 kbps) and Wi-Fi 802.11 b/g, DLNA, Bluetooth 2.1 with A2DP support, microUSB 2.0 and Infrared. When connecting the USB cable, you'll be able to choose among two modes: PC Suite, Mass storage. Both are intuitive and easy to use, so there's nothing more to add here. The process of synching is very fast, browsing and transfers are made very quickly between phone and PC and the device is also charghing when is synched with the PC. The built-in GPS receiver supports A-GPS function and works flawlessly together with the newly renamed Ovi Maps. In terms of messaging, the device offers standard SMS messaging solutions, accepting all available message types, but lacks MMS support. The message client works with POP3, SMTP, and IMAP4 protocols, and supports more than one e-mail account. Additionally, it can download headers and supports attachments. Nokia N900 also benefits from Skype and GoogleTalk VoIP integration, which might come in handy whenever you have it available as it cuts short the bills. N900 is quad-band GSM (850 / 900 / 1800 / 1900) compatible, but also supports HSDPA 900 /1700 / 2100 GSM networks. I didn't have any problems with the GSM signal and the sound at both ends was excellent. Video-calls are also not available for Nokia N900. Nokia N900 is powered by a single TI OMAP 3430 ARM Cortex-A8 family processor running at speeds of up to 600 Mhz. Further, the device also benefits from a dedicated graphics processor PowerVR SGX with OpenGL ES 2.0 support for better graphics rendering. Suffice it to say that I haven't encountered any lags or freezes, while the movies that I watched and the games I played really worked flawlessly. The smartphone embeds 32 GB user free internal storage memory, 256 MB SDRAM memory and 768 MB NAND Memory. If that storage space is not enough for you (which I doubt), you will be able to add up to 16GB through the hot-swappable microSD slot card. The latter can be found after removing the back hood of the device. Even though it has been tagged as an Internet Tablet, Nokia N900 includes decent multimedia features. The included music player supports audio formats such as: AAC, AAC+, eAAC+, M4A, MP3, WAV and WMA. Sound is impressive, but doesn't reach any of Sony Ericsson's Walkman series standards. Another drawback might be the fact that it lacks any Equalizer options, so you will be stuck with the raw sound of the song. Thanks to the 3.5mm jack port users will be able to plug-in their own headphone, if they're not satissfied by the earphones in the sales package (WH-205), which by the way sound pretty nice. Nokia N900 also features an Internet radio and and FM Transmitter. Stereo FM Radio is only available via third party software. The thing that amazed me is the quality of the movie playback. The video player included uses its 3.5-inch screen at its full potential and can now read DivX and Xvid files, besides 3GPP formats (H.263), AVI, Flash Video, H.264/AVC, MPEG-4, WMV. Even if it's only for the movie playback, I could say that this device is worth a try even for those that aren't looking for a business phone. The 1320 mAh Li-Ion (BL-5J) battery has an officially stated life expectancy of about 9 hours in talk time mode (5 hours for 3G). Also, Nokia didn't state any standby time as it thinks that the device will always be online and have an active connection. Basically, it has been designed to last about 1-day of continous usage. While I wasn't able to achieve the 5-hour talk time promised, our test unit made it for about 2 days with medium use. Unfortunately, I found the battery autonomy a little bit poor, even though I have expected it. Maybe one of the future firmwares will improve these numbers. I found the N900 one of the best Internet tablets on the market, even though there are only a few. Moreover, adding phone functions and a new operating system was very good idea, as it now stands for an excellent business phone also. Stuffed with lots of Web-browsing abilities, multimedia features, a user-friendly interface and a pretty decent camera, Nokia N900 really worths to be put into Nokia's new high-end class series. Maemo operating system is really a hit, even though not that complex and developed as Android, it really shows potential. Add to that the excellent Web-browsing capabilities, HSDPA connectivity, excellent touchscreen, as well as decent camera and you got yourself a really good smartphone. The QWERTY keyboard is also a nice addition to the features of the phone, as well as the Wi-Fi connectivity. I think the only drawback of the phone is the low life autonomy of the battery, and the high price as well, which could be a setback for those that have a limited budget. Also, limited number of third-party software is an important disadvantage, if we are to compare it with Android. Nearly each new day comes with new amazing gadget. This time it is new JVC XS-SR3 iPod speaker system. This design is impossible to mix with anything else. New JVC gadget is sleek and glossy, very unusually shaped. Looks like curved tube, wrapped around iPod holder. It was created to capture entire iPod line that is available on market: mini, video and photo, classic and newest touch technology devices. Unfortunately is not compatible with iPhone. Gadget is available in black or white color. The iPod holder is located in the middle of this construction and can be rotated in different directions for best viewing. Specially designed four clips will hold inserted gadget vertically or horizontally. Vertical hold is good for music listening, and horizontal is ideal to watch widescreen video. Two-cradle 2.5W tubular speaker system is created to simulate an illusion of surround sound, and it really works. New JVC device is armed with Dolby Virtual Surround support, remote control is included, two audio inputs (digital optical and analog), power output is 5 watts. Additional point to JVC XS-SR3 is that it also can be used as PC speaker system, with portable DVD players, different gaming systems or with portable TVs. This gadget with boosted audio quality that comes with many fine features is made in Japan and will be available soon. These days each store has all kinds of watches offers. Casio authentic quality watch on affordable price can be a dream but also a reality. Now in the season of winter holidays and discounts it is best time for hunting. So what shall we get if our trophy will be Casio Pathfinder Triple Sensor Multi-Functional Digital Watch? It is rather difficult to find a man without general idea about Casio quality, thus I will skip it. First of all I would like to mention that design and style is definitely sportive. Impossible not to see that it is really big size watches (case diameter 51mm, thickness 17.5mm, bind width 27.7mm). It is just perfect for big watches amateurs. If your wrist is not that big, it could be a problem. Now about Casio Pathfinder Triple Sensor watch main functions. It has 2 LCDs of different colors (green is for functions, blue for compass). This watch is very easy to adjust, comes with pretty many features: few alarms, compass, barometer, altitude indicator, and of course big readable time numbers. Background light is very good for reading, adjusting or even auxiliary needs as to find keyholes. Though I am not big fan of resin bands, but this one is very comfortable for wear and looks durable enough. Case is also made from resin. Calendar mode: day-date-and-month, movement - Japanese quartz, water resistant (330 Feet depth). Summary: This Casio gadget is a really nice piece - very functional, quality and mode how it works is above expectations. Big in size and precise to the second. If somebody got no idea about Christmas gift - this one from Casio can be pretty, worthy and affordable. Ultra small, unique and delicately designed - this way we can characterize this gadget. Agent Cam HD Video Recording camera is a useful gadget in many situation when is necessary to have some memories recorded. Any records could be made and saved. Time with family, business meetings, sport events, outdoor activity, evidence collector, security aim - only are few useful clues where Agent Cam HD will be useful. This small high resolution DVR cam allows to record up to 6 hours of video. Micro Mini DVR cam is a universal miniaturized piece to carry it anywhere. Reliable construction made from metal and glass, with USB port and Led indicator. Plug and play option for Windows or later editions. Micro Mini Cam is compatible with Windows 98SE / ME / 2000 / Vista / XP. Gadget dimension: 50mm x 50mm x 15mm (LxWxD). - Power source: integrated battery that is recharged directly via USB port or with charger. This Micro Mini DVR cam is a universal miniaturized piece to carry it anywhere. Reliable construction made from metal and glass, with USB port and Led indicator. Comes with all necessary set of functions to record video.